Hello and happy Friday! So, maybe you've seen this collection floating around...maybe you haven't. If you haven't, let me be the FIRST to talk to you about these polishes. Ever since creating my blog almost 2 years ago, I've made some pretty awesome blogger/vlogger friends. They are some the sweetest ladies I know and I love to support them when my wallet allows me to. The moment that Jess from Love for Lacquer posted that she was collaborating with Nailtini, I knew I had to grab these shades. Keep reading to see if the purchase was worth it! Look at Jess's face in my Nailtini Lacquer Cabinet box! I think i may have squealed a little and said, "I kinda know her!" when I got the package in the mail. Jess designed three shades that are shown below. When you purchase this set, it also comes with 2 mini bottles where you can mix your own shades. As much as I love frankening, I honestly don't think I'd mess with these colors. Did I give away my opinions already?? Okay, let's just get right to it. Below are my swatches. Jess, I hope my nails can do these polishes justice! First up is Bubbles & Berries. 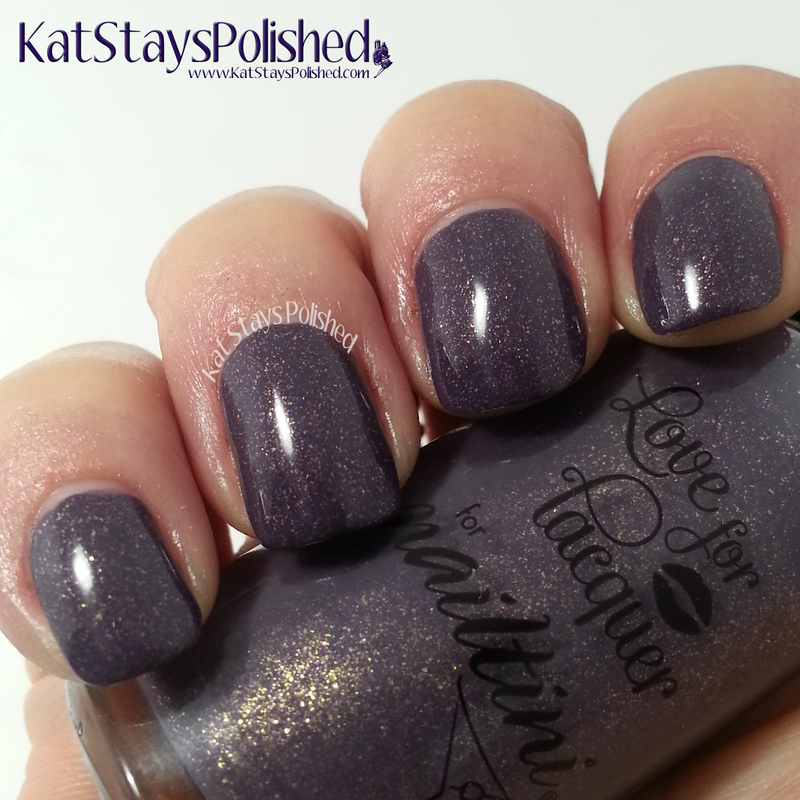 It is described as a deep berry purple awash with gold shimmer. Yes, yes it is! I applied 2 coats. With 2 even coats, this polish is AMAZING! 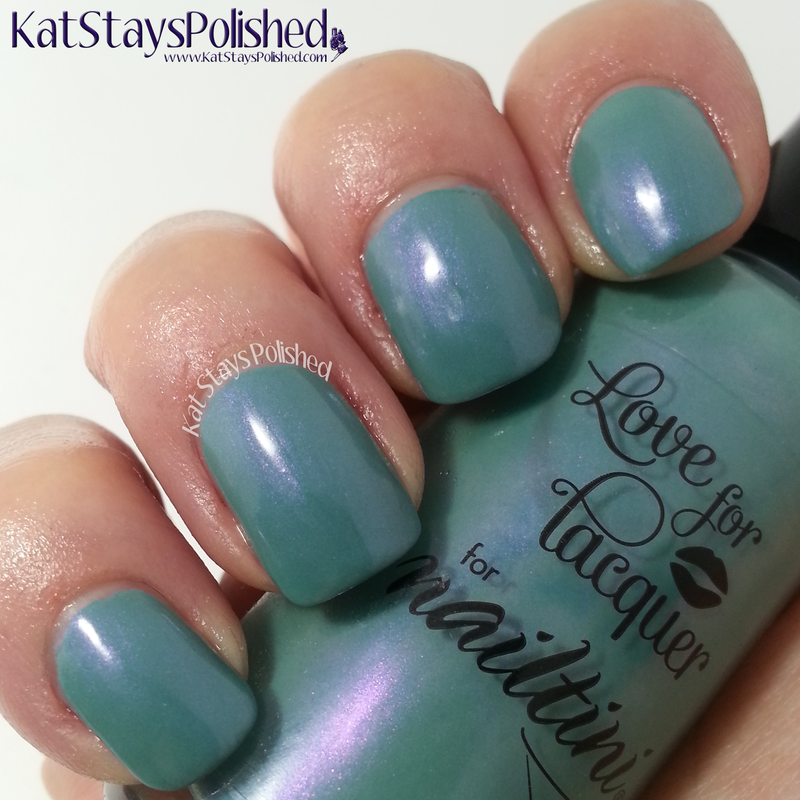 The formula has a great consistency and the color just pops right on my nails! Love it! It's definitely perfect for fall or any evening affair. 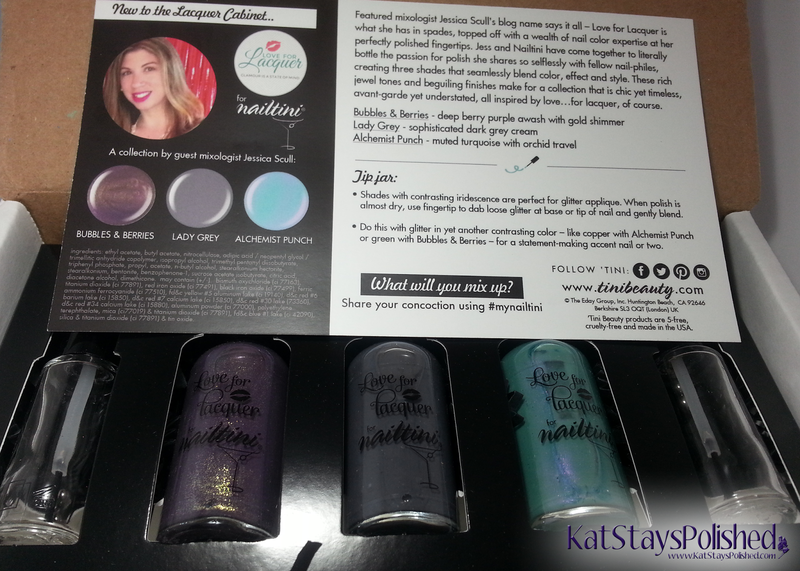 The second polish in this collection is Lady Grey. It's described as a sophisticated dark grey cream. I am FLOORED by how creamy this color actually is. I don't have many grey creams in my collection and I'm actually very happy to add this one to the stash. It applied flawlessly in 2 even coats. I might also mention that I love the long brushes that these polishes have. Makes applying polish easier for me. This last polish, I have to admit, was scary to me. Usually when I see that a polish has different dimensions to it...it usually doesn't show up on the nail and is very sheer. Imagine my surprise when this polish was most definitely opaque in 2 coats AND showed off the color shift. YAY! This polish is called Alchemist Punch and is described as a muted turquoise with orchid travel. So, what do you think? I absolutely LOVE these shades and i am so happy I bought it! You can get this entire set for just $25 HERE. Let me know if you have this already or if you're planning on getting it! Not sure how long it's going to be available so get moving if you want it! *Purchased by me. All opinions are 100% honest and my own. Alchemist Punch is my absolute favorite, lovely swatches! These polishes are SO gorgeous!! Hard to pick a fave! These are SO gorgeous! Bubbles & Berries is my fave! Love bubbles and berries. Great swatches. These are beautiful! Great for fall too. I love this collection - great job, Jess! Bubbles & Berries looks so pretty! Nice shades! I love the grey! I am obsessed with Lady Grey! They are certainly beautiful! I love a shimmer. I love the first two shades, but that blue is all wrong for me. They are gorgeously swatched but I don't think these colours are for me. Ohh i have never seen this brand before, but let me tell you, that Bubbles & Berries looks fantastic. Such a great deep color & one of the best shades for fall in my opinion. This is a cute set! Very nice color picks for fall!